7/28/17 Update – Giveaway had ended, I am currently trying to contact winners. Please check your emails to see if you’ve won! Like the idea of a hybrid mattress? How does winning one sound? Enter the Nest Bedding Alexander hybrid mattress giveaway today for your chance to win a brand new hybrid mattress! We’re giving away one (1) brand new Nest Bedding Alexander Hybrid mattress and one (1) brand new Nest Bedding Love & Sleep mattress. One grand prize winner will be randomly selected and win one (1) new Nest Bedding Alexander Hybrid mattress in their preferred size (Twin, Twin XL, Full, Queen, King; excludes Split King). Additionally, one runner-up winner will be randomly selected and win one (1) new Nest Bedding Love & Sleep mattress in their preferred size (Twin, Twin XL, Full, Queen, King; excludes Split King). Duration: The giveaway starts today, 06/12/17 and ends 06/27/17 at 11:59 PM PST. Grand Prize: One (1) grand prize winner will be randomly chosen based on the pool of entries. The winner will win one (1) Nest Bedding Alexander hybrid mattress in their preferred size and one (1) runner-up winner will receive one (1) Nest Bedding Love & Sleep mattress in their preferred size. Winner: One (1) grand prize winner and one (1) runner-up winner will be randomly chosen based on the pool of entries. Winners will have 24 hours to respond by email. Non-response will result in disqualification and a new winner will be selected. Winners must provide a US mailing address, email address, and phone number to be able to claim their prize. Winner will be announced via the Gleam widget, Sleepopolis.com, Facebook, Twitter, and other social media. Winner’s first name, last initial, and public thumbnail picture (that’s included in Gleam) will be included in the winner’s announcement. Sponsor: Giveaway prize is provided by Nest Bedding. Nest Bedding will mail all prizes directly to the winner. Giveaway sponsors may contact you via email. If you do not wish to receive these email communications you may opt out via the unsubscribe link included within those email communications. The giveaways featured on Sleepopolis would not be possible without the generosity of our incredible sponsors. We cannot thank Nest Bedding enough for donating two mattresses for this giveaway! I know this isn’t the best reason to want the matress that has no owner yet, but I would just like to have one that’s better than my husbands.. lol. Apparently I snore so we have never slept,in the same room. I went and got a matress I thought was good, turned out I stuck at buying mattresses, but i might be good at winning one!!!!! Thank you guys for this Awesome chance! Thank you Nest! Congrats to the winners! 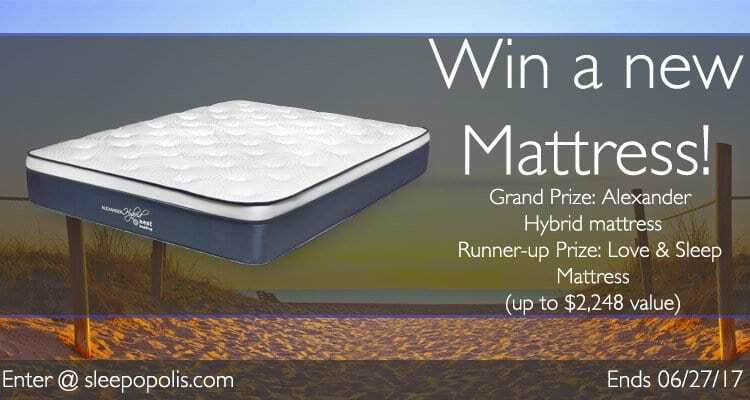 To win this would be wonderful, I suffer from back and neck problems and winning this mattress would be so wonderful. My mattress now is way over 10 years old. It looks so comfortable. I would love to win a new mattress!! I could use a new mattress. My dogs decided mine was a good chew toy and now I have two holes in mine. It’d be a dream to get a new mattress! I’d love to wake up, not feeling tired,or achy! Not sure if I did all I as suppose to to enter Lost page that showed ways to enter. Would love to win this mattress, I’m sleeping one my son gave me from previous marriage, needless to say it slants into the middle,lol. but I have RA and have lots of trouble sleeping without pain. Would love to have a good bed for a great nights sleep! Thanks for the opportunity at chance to win! I desperately need a new mattress. Mine is 43 years old and has long outlived its usefulness. We are now down to the point where we have to find low spots to sleep in at night. I’m not sure that the guys who do finally deliver out new mattress and box springs(whenever that may be) will be able to carry out the old one due to the accumulated weight of all the dust mites and dead skin. Will not let me enter why ? Have you logged into Gleam? I could really use a high qualit comfortable mattress! I need to replace a twin/ twin XL for a sofa bed and have been exploring your excellent site for days. Q1: Could you include the date of review when you post the mattress reviews and comparisons? This would help me figure out what’s current. Q2: Could you compare the Leesa with the new Brooklyn BME? I will certainly look into adding some sort of time stamp to my reviews. Thank you for your suggestion. With regards to comparing the Leesa and the new Brooklyn Bedding mattress, both are excellent choices. That said, there are a few small differences between the two. Brooklyn Bedding utilizes comfort layers of responsive poly foam and a quilted cover, whereas the Leesa is built with a thin cover and combines layers of Avena foam (latex-like foam) and memory foam. Both mattresses offer fast response times, but the BB mattress is going to offer less of a hug around your body, as compared to the Leesa. Both mattresses also offer a nice degree of bounce, great pressure relief, and certainly bring a good value to the table. Based on the information you’ve shared, the biggest decision you will have to make is what type of feel you’re looking for. If you want a little more hug, the Leesa is going to be the more appropriate option. Otherwise, I would give the BB a shot. Each of these do a fine job with regards to cooling as well. Thanks this would help in do many ways. And I’ll be glad to share my experience w my massage clients and fellow therapists. 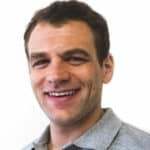 I help people resolve chronic pain through advanced medical massage techniques. I really need a new mattress the one I have is over 3 years old and really showing it age. Suffer with back spasms really would like to try it out. I would be very grateful if I won this as it’s been years since I’ve had a comfortable night sleep. Sleepopolis, you need to connect with the Marriott Hotel chain. I haven’t slept in any of their beds without waking up with back and/or neck pain. Their beds are absolutely uncomfortable! I’ve slept on their mattresses in AZ, IL, CA, TX, and even in Shanghai, Beijing, and Chongqing China. I would have gotten more rest in a hammock. You can recommend the Nest Bedding Alexander Hybrid mattress to them. I’m 100% certain they would be less expense than the ones they’ve bought for their hotels and 1000% certain they would be considerably more restful to sleep on. Thank you Nest and Sleepopolis. Thanks for your suggestions! I will take them into consideration. We need a new mattress badly. My husband was in a motorcycle accident and suffers from pain so much he can never sleep through the night. I am disabled and toss and turn from pain and uncomfortable sleepING on our old mattress for 10yrs. Please select us as a winner. We would be so grateful n and sleep so much better. Thank you. Thanks for your interest in the Alexander hybrid giveaway! Best of luck to you! I had to comment agin after watching the video I like how the kid is saying the pro and cons because a lot of companies always say that there things that there making is the best of the best and I like how u guys are saying pro and cons makes me believe that it’s a good product am not saying this for me to win am saying what I saw !! I good use a bed like that I’ve Ben to stores and tried some beds and just can’t afford it my back is bad and R.A on top of that and wow could use that bed . Or like I said on my other comment a min ago if I didn’t win at least someone like me with same issues or poor that can’t even look at a bed because of no money!! And agin thank u for giving a bed to us poor people that are just pulling theeth to get by !! My guess that someone with money won’t be looking for a free bed my thought !! My memory foam mattress forgot! I need a new mattress!! I could use a bed. I currently don’t have one and being a diabetic and having cancer it would be nice to win a free bed and be able to actually get a good nights sleep!! WOULD BE SO GRATEFUL TO WIN A NEW MATTRESS.MINE IS 23 YEARS OLD AND I CAN’T AFFORD A NEW ONE ON SOCIAL SECURITY BUT I COULD PAY THE TAXES THAN SLEEP LIKE A BABY. I so need to win a new mattress. Mine has had it. Could really use a new mattress. Mine is 15 years old. I am a senior citizen in desperate need of a bed and matress& box springs.If i could work or had monthly income to buy mine there is no way i would be doing this because i know there are others in need. What a great and generous give away! I love the NestBed website and like the fact that they are a socially conscious company! Would love to win a Nest Bedding Alexander Hybrid mattress or a Nest Bedding Love & Sleep mattress. I sure could use a great night’s sleep. sure would like to win this bedding. Dreaming of sleeping on a new mattress. Nest is best!!! I would LOVE to be sleeping on this new mattress! Thanks Nest and Sleepopolis for another oppertunity!!! You’re welcome :) Good luck! Moving cross country and looking for the perfect bed to join me there! I would really appreciate winning this mattress! Could you try again with a different browser? Please let me know if you are still having difficulties. I need a queen size mattress so bad, my old one has so many dips in it that it is impossible to get a good nights sleep. After visiting your site, I think I would like to win this mattress. It seems to have the qualities I have been looking for. You need to enter using the Gleam widget above.